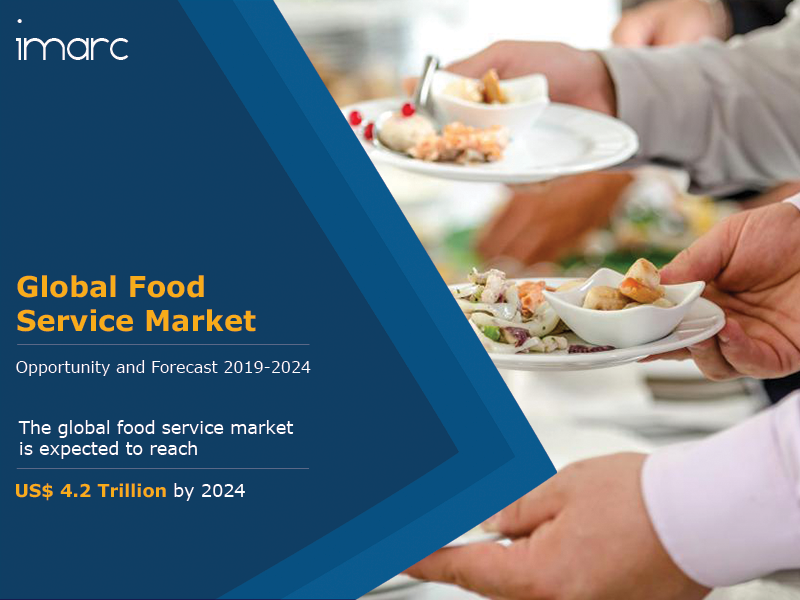 The global food service market was worth US$ 3.4 Trillion in 2018. Foodservice refers to the sale of food and beverages that are prepared for immediate consumption or for takeaways and home deliveries. Foodservice outlets are classified into two sectors: commercial establishments which include fast-food restaurants, catering, nightclubs and recreational outlets. Non-commercial outlets which include food operations that run inside the premises of an organizations such as hospitals, schools, military bases, etc. The food service market can also be classified on the basis of operation systems, into conventional system where the ingredients are assembled, prepared and served on the same premises. Centralized system, in which food production is centralized and is then transported to the kitchens at different locations. Ready prepared system in which the food is prepared onsite and stored chilled or frozen until required, and assembly-serve systems in which pre-prepared foods are purchased, stored, assembled, and served to the consumer. Growing demand for customization and innovation in food menu options is among the key factors driving the global foodservice market. Consumers are provided with a wide variety of alternatives to customize their meals according to their taste, dietary and budget preferences. Millennials and working professionals are the key target consumers for the market owing to their increasing preference for hassle-free, nutritious and hygienic food that is readily available. Additionally, commercial restaurants and cafés have emerged as a convenient place for teenagers, families, and young professionals to socialize and relax, thus catalyzing the growth of the market. Moreover, development of e-commerce/online platforms and on-the-go food services coupled with innovations in packaging, introduction of low-fat beverages, gluten free products, etc, are also contributing significantly to the growth of the market. Furthermore, factors such as increasing number of working women, reduced practice of preparing home-cooked meals, increasing disposable incomes, improving distribution channels, etc. are also catalysing the growth of the market. Looking forward, IMARC Group expects the market to reach a value of US$ 4.2 Trillion by 2024, registering a CAGR of 3.6% during 2019-2024. The report has also analysed the competitive landscape of the market along with the profiles of the key players operating in the market. How has the global food service market performed so far and how will it perform in the coming years? What are the key regional markets in the global food service industry? What is the breakup of the market based on the type of foodservice systems? What is the breakup of the market based on the types of restaurants? What are the various stages in the value chain of the global food service industry? What are the key driving factors and challenges in the global food service industry? What is the structure of the global food service industry and who are the key players? What is the degree of competition in the global food service industry? What are the profit margins in the global food service industry?